Posted byWaldo Jaquith	 June 27, 2011 12 Comments on My new adventure: The State Decoded. A little project that I started a year ago now has been eating up a lot of my time, especially in the past eight months or so. I decided that, as Richmond Sunlight improves the display of legislation, I should create a new site to improve the display of the state code. It could hardly look any worse. (See § 18.2-32. 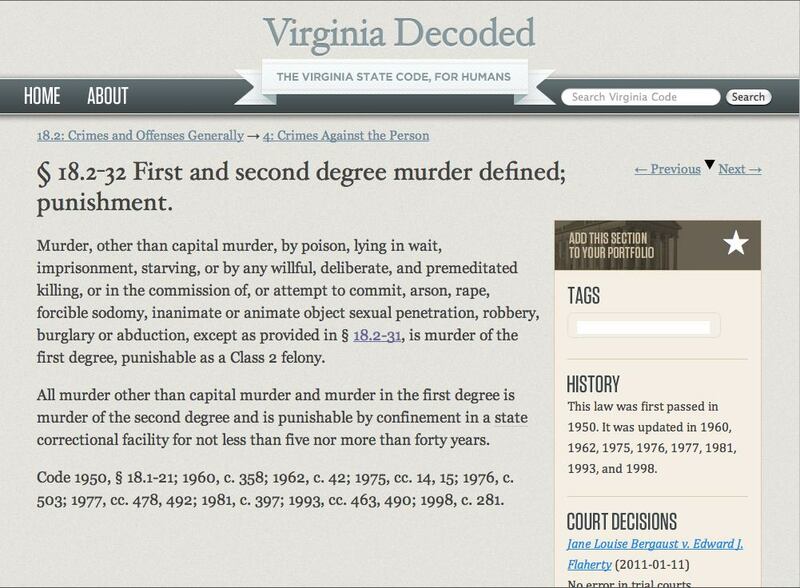 First and second degree murder defined; punishment.) By late last fall, I’d spent a lot of time looking at other states’ codes, and realized that they’re all bad—states had put their codes online around 1995, and hadn’t really bothered with them since. So I applied to the News Challenge, proposing to expand this Virginia-focused hobby into a full-blown project to improve all state codes. The News Challenge is an annual competition held by the John S. and James L. Knight Foundation, for which they accept thousands of grant applications, and a few are selected as winners on their basis to “advance the future of news [with] new ways to digitally inform communities,” in their words. There were north of 1,600 applications, and mine was one of 16 to win, I learned a few weeks ago. A bit more detail about my project—“The State Decoded”—is available on their website, and lengthy coverage is available from the Nieman Journalism Lab. In a nutshell, they’re giving me $165,000 to spend a year and a half modularizing this code and making it available to groups in every state in the union to put their codes online. A bunch of that time I’ll spend coding, and a bunch more I’ll spend identifying stakeholders in states across the country, convincing them to deploy this (free) software to make their state codes more accessible. I spent the whole last week in Cambridge, Massachusetts at the MIT–Knight Civic Media Conference, an invitation-only, all-expenses paid conference at which the News Challenge winners were announced before the audience of a few hundred people. We all made brief speeches about our projects and received trophies, and then got to spend a few days in the company of some awfully interesting people. Obviously, this is an exciting change for me. My employer, The Miller Center, has kindly agreed to act as the fiscal agent for the grant, so I will continue to work there, although nearly all of my time will be spent on this new project. I’m working on getting back to Virginia Decoded, the project that spawned all of this, which I’ve (happily) had to delay a bit to get started on The State Decoded. John Athayde has been doing some great design work on it recently, and a couple of dozen people have been alpha testing it for the last month, which has been really helpful. Once I check off a few more features from the feature list, I’ll open it up to all of the beta testers. I’ve personally found the site really useful as a legal reference tool, so I’m eager to see it accessible to a wider audience. I hope you’ll like it, too. Wonderful project, Waldo. I would have thought this sort of thing had been done before, but time and time again you have demonstrated that public entities have a long way to go toward joining the 21st century. Hit me up if you want to brainstorm any technical issues on this project. Congratulations! I know you’ll do a great job. Looking at that screenshot, it looks like . . . free Westlaw. Except more basic, and yet, just as awesome. I’m wondering two things, which are probably way far down your path on this project. 2. With regard to case linkage, what kind of scope are you planning? Are basic trial level cases that are persuasive but not binding going to go up? (like in PA, as a basic example, a Philly Common pleas case doesn’t bind a Pittsburg case of the same level. Or unpublished cases that aren’t printed up in the official books but are still available online.). It might be helpful to have some info up about the structure of the courts in VA–even a flow chart–so people understand what’s relevant. Again, I know that in PA, it gets ridiculously complicated. If long time practitioners have to draw up flow charts, it might be even harder for people who have no legal background. Now that I’ve thrown all this work at you … no, seriously, this is an excellent project, Waldo. I’m sure it is going to be great! Despite the fact that each of us likely cancels the other’s vote on every statewide election – I’m really glad you’re here in the Commonwealth, Waldo. Keep up the great work. Damn! that some impressive stuff- well done! Looking at that screenshot, it looks like . . . free Westlaw. Are you going to include links to law review articles on those sections of the code? The possibility never crossed my mind, but it’s a fine idea. I’m guessing that the only reasonable way to do that will be via Google Scholar (e.g. this search), which unfortunately does not have an API or even RSS for search results. I’m not sure that’s technologically feasible yet, but I’ve added it to the feature list! With regard to case linkage, what kind of scope are you planning? Also, there are a lot of issues where there isn’t really an on-point case so you have to argue that Virginia (or wherever) should follow another state’s rulings–I’m wondering if, waaaaay down the line, if it might be worthwhile to link to other state’s code websites. Now you’re getting the idea. :) By having multiple state code sites that share a common API, my hope is that it’ll be possible to share data between them. That’s when the really fun stuff can happen! For law reviews, you may want to hit up SSRN. Most professors I know hit that up, as well as Westlaw, HeinOnline, and Lexis.